Sewing skipped a generation in my family. Growing up we didn’t have a sewing machine at home and I never saw my mother sew. The first time I sewed was in Home Economics class in 8th grade. I was terrible at it and got a C- on our final project due to wonky seams on the Bermuda shorts I’d made, but I could tell that sewing was amazing. I asked if I could use some money I received as a Bat Mitzvah gift that year to buy a sewing machine and my parents took me to G-Street Fabrics in Rockville, Maryland to pick one out. I got a Bernette 330, a very basic but well-made machine, and it was with me for 23 years. For the first 20 of those years I was alone in my efforts to learn to sew. I would try to follow patterns or design something on my own, but without knowledgeable guidance I didn’t get very far. I didn’t even understand how to shop for fabric. I’m 38 and I know that there are many women my age who have a similar story. Our mother’s didn’t sew because they didn’t have to. When mass-market clothing started being produced outside the United States causing clothing prices to drop dramatically it became more expensive to sew a dress than to buy a dress. My mom was a feminist and a writer. She did many things, but making clothes for me wasn’t one of them. The sewing pattern business is dominated by two big pattern companies: McCalls (which owns Vogue, Butterick, and Kwik Sew) and Simplicity (which owns New Look). These companies have weathered the changes in garment manufacturing and sewing trends without changing their product much. Pick up a vintage pattern at a rummage sale and you’ll see what I mean. Sizing and style has shifted, but the contents of the envelope are very much the same: model on the front, charts on the back, tissue inside. All those years I was struggling to learn to sew, standard patterns were a source of intense frustration for me because they assumed knowledge I didn’t have and had no way to access. I wanted to sew, but couldn’t because I didn’t speak the language and had no interpreter. Sewing is seeing a significant resurgence now. Women (and men) today don’t have to sew, but want to. Sewing connects us with the objects in our lives. It’s practical and creative and, depending on how you swing it, it can still save you money. But most of all, today sewing is a luxury, a way to unwind and to make something that expresses who we are. The new wave of sewists is online, connected with one another, sharing information, and a big part of our connectivity is fueled by independent pattern designers. A sewing pattern is an ideal thing to publish independently. Self-publishing is so nimble, designers can go from idea to salable product very quickly, staying on top of what’s new and exciting. An independent designer doesn’t have to appeal to everyone, the way a big pattern companies must, so she can focus on a niche population, giving them just what they desire and doing it terrifically well. Indie patterns aren’t a new thing, per se (there were independently published patterns available in the 80’s and 90’s), but what is new is that regular customers are able to build relationships with the designers whose work we love. Every pattern put out by one of major pattern companies is designed by a person, of course, but that person is very hard to access as a consumer. If you have a question, you could call the company’s customer service line, and from what I hear you’ll get a helpful response over the phone, but I can guarantee that the response won’t be from the designer herself. Email an indie designer with a question and you’re very likely to get a personal email back. Breaking free from the standard pattern envelope, independent pattern designers are recreating the sewing pattern. The most successful indie patterns are much more than just templates and instructions. Many are in effect sewing lessons, chock full of photos, videos, and helpful tips. Instead of assuming you already know, they assume you could use some guidance and happily give it, not only in the pattern but online. The experience of buying a pattern from an independent designer whose blog you read is similar to buying a piece of art directly from an artist in her studio. You know where the money’s going. You know what’s going on behind the scenes. You are part of the action and part of the community. Sewing is a luxury now, not a necessity. The process of making something with your hands should feel luxurious. A quiet afternoon spent with beautiful fabrics and thread, and a pattern designed by a woman you feel connected to and guided by, enriches that process and makes it more meaningful. Indie pattern designers make sewing exciting and new again. I learned how to sew through blogs, books, trial, and lots of errors! I still don’t consider myself a fantastic sewist and find it difficult to follow a pattern. I think that because I learned in the way that I did, I can sew without a pattern and I had to figure out the principles of how things go together to become a bag, or a stuffed animal. It made me pretty fearless when approaching something new and different. Through proper teaching, I could definitely become faster and more efficient, and probably open up a pattern with more confidence; but I wouldn’t trade my learning process for anything in the world! It’s so funny you posted this… I was just thinking about this topic yesterday! It’s so interesting that you posted this, Stacey. I’ve been pondering that problem with PDF patterns lately, too. I love that you comment on the luxury of home-sewing/DIY, Abby. I’ve been interested in that intersection since I got involved in quilting. I love all of the positive things you point out about indie patterns and their ability to help us develop our sewing skills. I think that’s an important distinction between such patterns and the big-manufacturer-published ones that assume that you already know all of the sewing techniques necessary to complete a project. Great article–thanks, as always, for your insightful take on this industry! There are plenty of indie designers who publish paper patterns – and often the extra cost of these are worth the improved fit, and time and cost savings from not having to print something out yourself (although with the increased paper quality you’d likely want to trace the pattern anyway). Abby, as I was reading this I couldn’t wait to read the comments. Yours is one of the few blogs where I make sure to click over! Oh yes, I have been that person tearing their hair out over the big box patterns – ugh! I’m so glad the industry has evolved. This is a very interesting perspective. Having had a few classes and a mother that sewed a tissue pattern was never much of an issue. But this give me better insight into why some knitting designers explain everything in detail. From my perspective it complicates that pattern, but that is because I don’t need the additional information. I don’t sew enough these days to have any opinion on indie patterns. But I must agree with Stacey…if I had to print and tape them together, that would be too much hassle. I have enjoyed your perspective as well as all of the comments. I learned to sew a long time ago and then got busy raising children and working full time to keep said children fed and clothed. I began sewing again a few years ago and then recently found the online sewing community. I love the blogs, patterns and very valuable information that is just a few clicks away. Indie patterns are great and I do purchase tissue versions of the ones I like. Just old fashioned in that sense, I guess. I love that those designers are available to answer questions or offer sew-alongs to encourage and provide inspiration. At the same time, I work part time in a fabric store where I teach classes and work with customers to help them through their projects whether it be patching a hole in their jeans to creating a window covering for the kitchen. I think that we live in a very exciting era where individuals can find help and encouragement so easily no matter where they turn. Thank you Abby, for all that you bring to the sewing community with your books, patterns and insight. I totally agree that learning on my own has made me fearless. I just jump in and I love that! Thankfully a lot of indie pattern designers do have print patterns for sale, especially for garments. Colette and Lisette patterns are good examples. 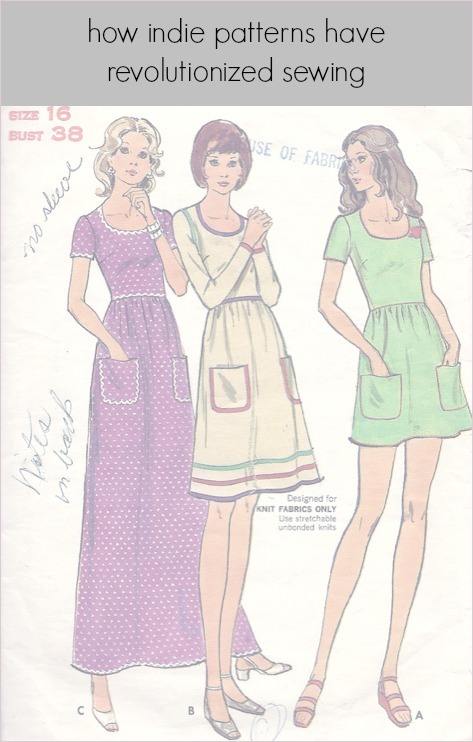 I would certainly turn to them first before a a McCall’s pattern if I did want to sew myself a dress. I feel so thankful to have discovered the online sewing community when I did. I literally learned to sew from reading blogs, and buying books that other bloggers recommended. Well that makes me feel good! Thank you! And that is what you’re known for, Erin. It’s so wonderful to really teach with a pattern, and to help people have a great experience instead of a frustrating one! Or if not the industry itself, people have evolved around it. It certainly would be for a garment pattern and that’s why I think there will always be a place in the sewing world for print patterns. PDFs are awesome, but not when you have to do so much tiling, cutting, and taping. It’s great to know that there are knowledgeable store employees out there helping customers through their tricky sewing situations. That’s terrific! My mother did sew and I sewed, off and on, from childhood. But even with that background, I didn’t really get into sewing until the online sewing world took off a few years ago. I’ve learned so much from bloggers, online tutorials, and indi pattern makers. It’s truly an amazing resource. It stuns me now that I can see a technique I’m interested in, search for images online, and in an hour or so have read several well-written, well-photographed blog post detailing the very thing I wanted to know. Amazing! I agree and I also want to point out that it applies to knitting and crochet patterns too. I provide support with my patterns. I always answer back with help or send links to videos on YouTube that might explain a technique until I am sure the knitter/crocheter can make their item. I also find that indie designers add extra photos and links to videos in the patterns themselves, patterns from big companies have less information and are less detailed. And with most designers on most social media platforms they are accessible to the crafters who need them. And also the other way round we can gauge interest easier. And for yarn crafters the availability of ravelry makes it even easier to notice trends and see what people want and like. I’ll definitely have a look at Colette! I’m finally reading this article, and can’t agree more. I am one who learned to sew with tissue paper patterns under my Mom’s tutelage, but the indie patterns are what keep me fresh and learning. There’s always a tip out there that I can put into practice to make my projects sew up more quickly, with less effort and with great finished results. I am in the season in life where I have granddaughters who are wanting to learn to sew, and the indie patterns are GREAT for teaching them. One of my granddaughters is 8 and she was 6 when she sewed her own skirt – from an indie blog tutorial. It looked great, and she was SO proud. Sewing has a unique ability to connect generations. Love your blog. Hey, we’re from the same area! I used to live in Gaithersburg. It’s interesting what you said about indie patterns being sewing mini-lessons. I give away patterns on DeviantArt, and recently I’ve started posting them as a .pdf that includes info on tools, selecting fabrics, how to read a pattern, etc., it’s so much easier than answering the same questions over and over in individual comments. It’s pretty much boilerplate, I can tweak it a bit for individual patterns. I also meant to mention, I’m in South Africa now, and considering how wonky our mail service is, it’s MUCH easier to use a pdf than a paper pattern, which may end up in Narnia (I got a package in January that had been sent from the states in August). Isn’t it terrific! I love the online sewing community. I know that this is true from personal experience. I learned to crochet the right way from Stacey Trock’s FreshStitches patterns. Without her step-by-step instructions, photos, and videos, I would never have understood how to make an amigurumi. I think it helps sewing seem more hip when it’s online where kids can find it and interact with the designers and craft book authors, too! Plus postal rates are so high! PDFs are not only instant, but they’re much cheaper! I know it’s absolutely not the case with all independents but in the main I have had a very different experience of indie patterns. I find that people who make great creatives don’t necessarily make great pattern writers. Information is missing, they haven’t been tested, workmanship is sloppy. It seems in an effort to feed a blog publishing cycle or jump on board with a current trend, an idea is thrown together and immediately published (I call it junk craft). It can be incredibly frustrating when you’ve spent good money on fabric or yarn only to find the pattern doesn’t quite work. Thank you so much for sharing this opposing opinion, Tara. It’s certainly true that one of the downsides of easy self-publishing is that there can be a lack of editing and testing. It’s also true of many mainstream craft books. I know that frustrated feeling of wasting time and materials on a project with poor instructions. I do think that there is an upside to easy self-publishing that might outweigh the downside for the consumer and that is the availability of more niche and creative designs that don’t have wide-enough appeal to be published in a mass market. What a great article! I so agree. I too did not have a mom who sewed and have largely taught myself. When I first started, I only knew of printed patterns, (in high school in the 90’s), I would buy them and they’d sit in my sewing box. Every so often I’d pull one out and start looking at it, thinking about making it, but then I’d get overwhelmed and discouraged. But in the last 5 years that I’ve discovered the world of indie patterns, everything has changed. I LOVE to sew and search out new fun patterns. I don’t know that I’ll ever try print patterns again. I have no problem at all printing and taping from a pdf, and I also love to know I’m supporting someone’s work and art. With the everyday language and lots of photos, there hasn’t been a pattern I’ve bought I haven’t been able to complete. The reason my projects don’t all get made now is that I don’t have enough time for all the patterns I’ve got! Someday I would love to be able to apply all I’m learning to be able to make my own patterns and contribute my own ideas to the marketplace. And that’s the beauty of the indie marketplace is that I can have those dreams, unlike years ago when I would have had to go to fashion school or something and get a job at one of the big pattern shops. That’s so awesome to hear, Laura! I feel exactly the same way.